an image provided by the event organizers. From March 1st through the 11th, game developers from around the world participated in the Cyberpunk Jam, an event which challenged developers to create a game based in the cyberpunk genre. 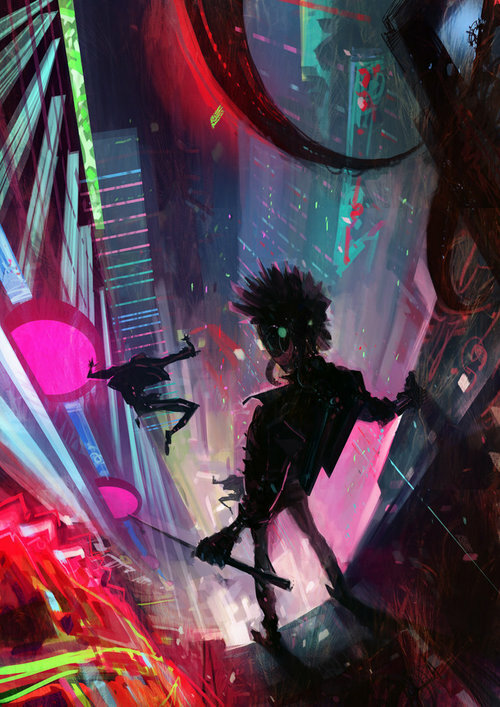 The only rules for the Cyberpunk Jam were the game must be cyberpunk-themed, and based on an image provided by the event organizers. By the end of the game jam, 256 games had been produced. The following five were some of our favorites. Cyber Rise, developed by Teddy Bradford, is deceptively difficult. The entire game involves the player bouncing a ball up an endless staircase, while the camera slowly pans upwards. Endless chasms surround each platform and, thanks to the forced perspective, the only indication of where the ball will fall is its small shadow. A slowly pulsating single-source of light bumps the difficulty up a notch. Luckily there are light orbs scattered around the platforms that players can pick up to slow the ascending camera, allowing a bit more time to carefully execute jumps. My high score is 95, Teddy’s is 184…what can you get? 9.9, developed by “rogueNoodle“, is an intense hacking simulator where the player must utilize quick reflexes in order to collect data nodes and avoid being detected by security nodes. The entire game takes place on a number of circular layers which the player can rotate around and jump in between. The arrow keys move the player’s avatar up and down through the layers, as well as changing rotation direction. RogueNoodle has participated in a number of game jam events previously, and hosts his past games on his itch.io profile. Renegade Ronin, developed by LaFleur Games, puts players in a high-speed motorcycle chase straight out of an 80’s movie. Armed with either a Gatling gun or a shotgun, and a katana, players must race to the objective, without being killed by pursuing antagonists or dying from wrecking into the other vehicles on the road. Hackerpod, developed by CCat Games, is an endless-faller where the player must navigate a ship through cyberspace as it downloads data from the system it is currently traveling through. In the game, cyberspace is represented by spheres and ribbon-like roads, which are perfect for the ship to glide right along the edges. The longer the player drifts off of an object and floats through empty cyberspace, the quicker the security system will detect, and eliminate, the player. Hive Runner, developed by Christopher Yabsley, is a 2D platformer that requires a trial-and-error approach. The player only has 2 minutes to get to the end objective, but armed guards and endless pits stand in the way. Players must memorize the patrol patterns of the guardsmen in order to avoid them, take them down while their back are turned, and quickly continue on their way. It’s Mirror’s Edge meets Super Mario. All 256 games created for the Cyberpunk Game Jam are playable on the event’s official website. Some games (including all in this list) can be played directly in-browser, while others require OS-specific downloads.